Breezango has been a fan favorite since the tag team's inception. From their original incarnation as 'Zoolander'-esque stupid male-model types, to their present day 'Fashion Police' gimmick, Tyler Breeze and Fandango have endeared themselves to the WWE Universe with their comedic chops and willingness to debase themselves to get a pop from the crowd. It also doesn't hurt that they're both great workers who consistently make their opponents look like a million bucks. But through it all, they haven't had any merch available for purchase in the WWE Shop. Not even so much as a plastic badge. 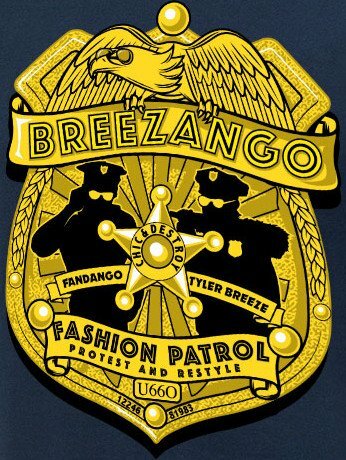 That all changed today, as Breezango got their first T-Shirt. I'm sure it will be impeccably designed, with bright colors and witticisms galore. Number 1, it's NAVY BLUE. Like, that's the blandest color possible. And the yellow badge? They just went with the laziest color scheme available, the stereotypical police uniform colors. Ugh. What? No Lavender? No baby blue? Just Navy and Gold? AND IT DOESN'T EVEN SAY FASHION POLICE. It says "Fashion PATROL." That's not even a thing! But do you know why? (I looked this up.) It's because in certain states, it's illegal to wear a shirt that says 'Police' on it. Seriously. So when the designers found this out, did they go "okay, let's do a "Fashion Files" design instead? Nope, they were like "F*ck it, just call them the Fashion Patrol. Nobody will even notice." Well, we did notice, designers. We f*cking NOTICED. You know what else I noticed? 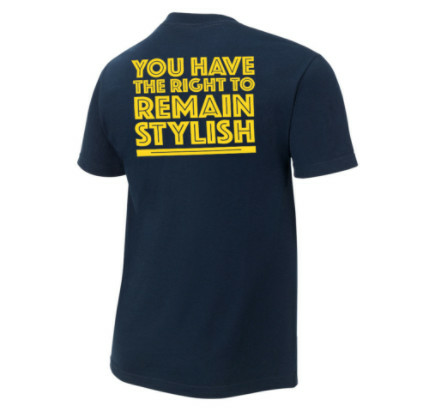 That you used the Jurassic Park font for the terrible slogan on the back--a slogan, mind you, that Breezango has never uttered in the history of their time as a tag team. WHAT THE HELL DID YOU DO, WWE? WHY DID YOU DO THIS? All right. Upon closer examination. this isn't so bad. I really love that the eagle at the top is wearing aviator shades. The Breeze silhouette has his furry selfie stick slung rakishly over his shoulder. Bonus points. "Chic & Destroy" is very clever. I like that a lot. "Protest and Restyle" is not. I don't like that at all. But the best part of this is that at the bottom, the serial number on the badge is "U66O" or, of course, "UGGO." So what's the A-Train verdict? Buy this shirt. We need to support Breezango. They deserve it. Like it or not, merch sales drives TV time. Not to mention, it also puts a little extra scratch in the pockets of our boys in blue. Now, whether you choose to WEAR this shirt is up to you. The color scheme is bland and unimaginative, and the slogan on the back is dreadful, but maybe if you wear it A-Train style, under a zippered hoodie, nobody will see the back of the shirt, and you can get away with it. Because according to A-Train, there's no better look than a clever t-shirt under a comfortable zippered hoodie. And it will never earn you a violation from the Fashion Police.